Cooking fish can be intimidating, but it doesn’t have to be. 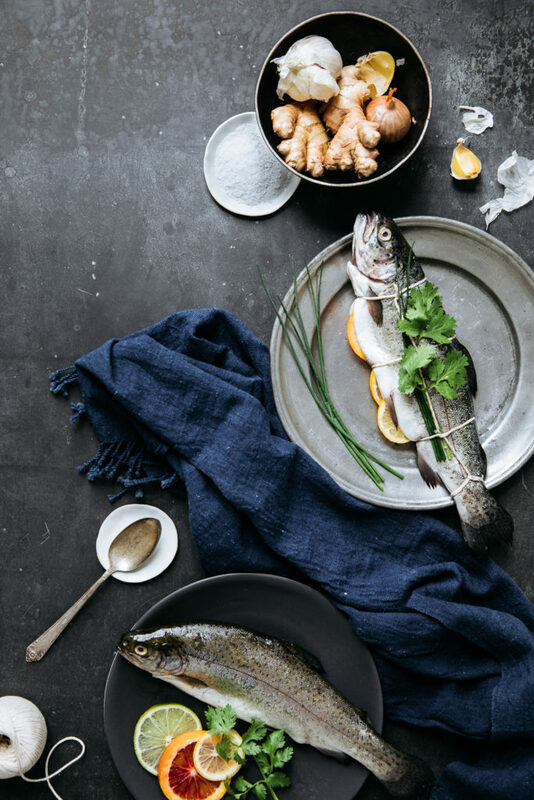 Whole roasted fish makes for a simple yet elegant dinner, and cooking it in the Wolf Gourmet countertop oven couldn’t be easier. 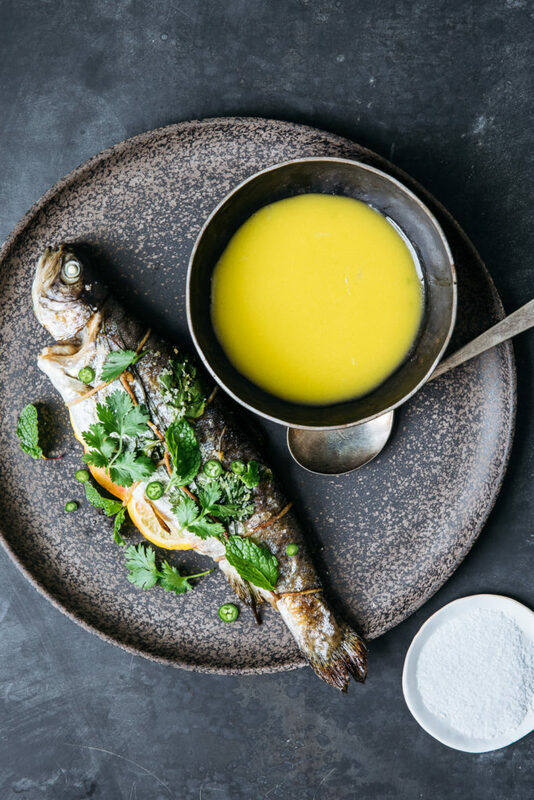 For a quick and elegant dinner, consider whole roasted fish like a trout or branzino. Because they are smaller in size, they cook up fast and perfect every time. 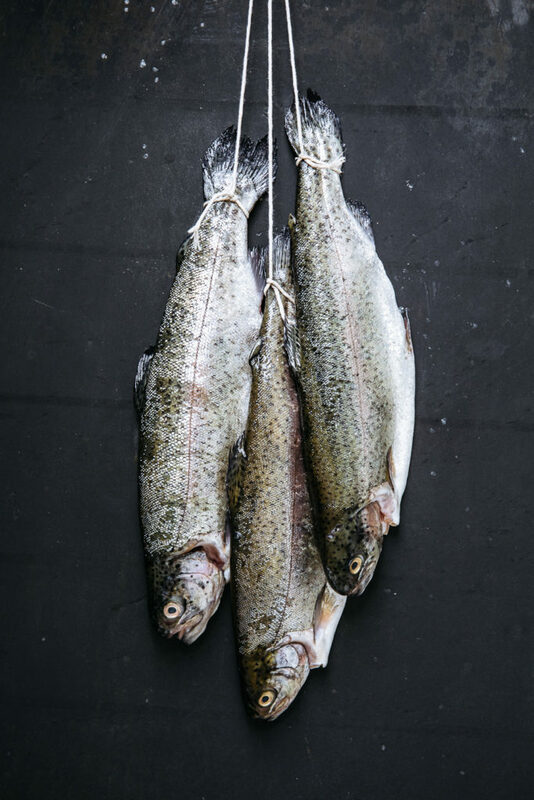 Start with the freshest fish you can find. The eyes should be clear, and the fish should smell like the sea. Keep things simple and ask your fishmonger to clean the fish for you. Make sure to keep the whole fish intact, head to tail. Once you are home, all you have to do is stuff the fish with lots of fresh herbs and bright citrus before roasting. The Wolf Gourmet Countertop Oven makes the cooking process effortless. 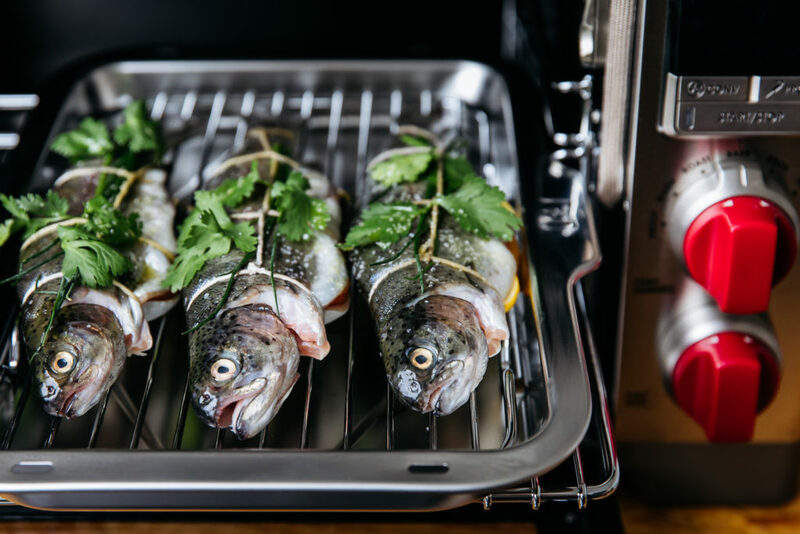 Just place the fish on the rack set inside the sheet pan, so the heat circulates all around the fish and roast. When the fish is nearly done, set to broil for a golden, crispy finish. 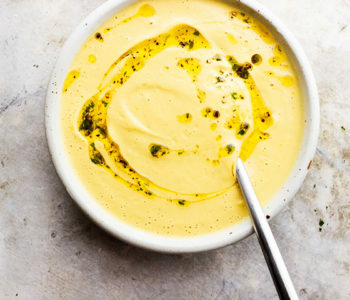 Serve with a tangy, herbaceous sauce on the side and enjoy. Set aside a small handful cilantro stems and chives to stuff the fish. Finely chop enough of the remaining chives until you have about 1 Tbsp. In a small bowl, combine the chopped chives, Serrano pepper, honey and olive oil. Using a Microplane, grate the garlic into the mixture. Stir in the lime zest and lime juice. Season with salt and pepper. Prepare a sheet pan with an oven rack placed inside. Lay the fish on a large work surface covered with parchment paper. Season the cavity of the fish with salt and pepper. Stuff each fish with 3 slices of citrus and 2 or 3 stems of cilantro set aside earlier. Drizzle the outside of the fish with olive oil and season with salt and pepper. 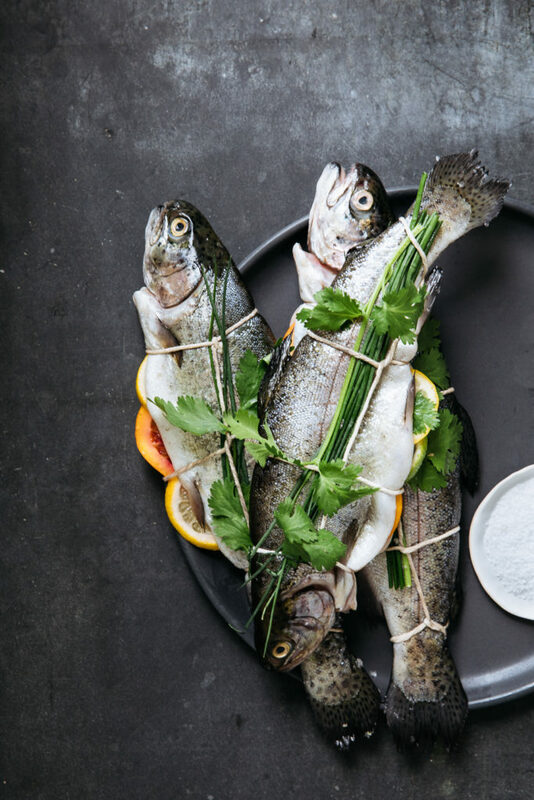 Lay a small handful of the remaining chives and cilantro stems on top of each fish and secure with kitchen twine in 3 places. Transfer the fish to the prepared sheet pan. 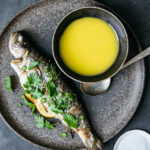 Roast the fish for 10 minutes, then turn on the broiler and roast for another 5-7 minutes, until crispy, golden and starting to char in some places. The internal temperature at the backbone should be 140°F. Transfer to a platter and scatter handfuls of torn cilantro and mint over the fish. Serve the sauce on the side. 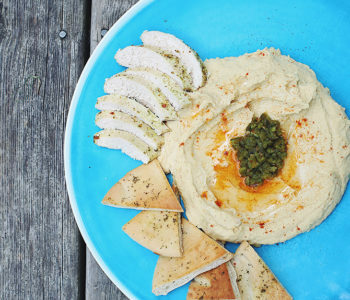 Evan Kalman is a photographer, stylist and recipe developer, as well as the creator of the food blog add1tbsp. 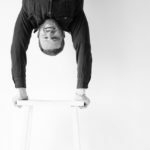 Based in Philadelphia and Brooklyn, his work is inspired by elevating dishes through photography, ingredients and technique. 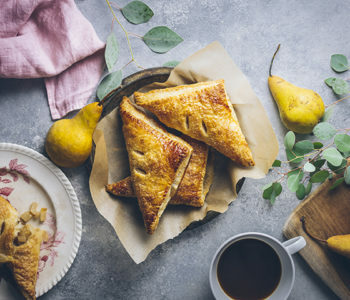 His photography focuses on capturing the mood and execution of a recipe through natural light.